When her 15-year-old daughter announces she’d like to go on a family trip to Antarctica, life takes a turn for Bernadette. She hates Seattle and is content staying home, away from people. Bernadette hires a virtual assistant in India to make arrangements for the trip and to stop her pesky neighbor’s nagging about their yard. When a harmless prank against said neighbor goes wrong, it starts of chain of events unknown to anyone until it’s too late. 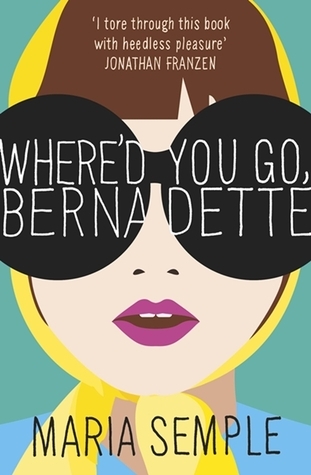 When Bernadette disappears, her daughter Bee collects a paper trail of information to try to find her mother. After an interview with the author on NPR and a review in Entertainment Weekly, I was chomping at the bit to read this book. It was just as bizarre and interesting as I thought it would be. Told in somewhat of an epistolary format through emails, conversations, faxes, and Bee’s narration, the reader learns about Bernadette’s hatred of Seattle, her past as a famous architect, her pesky “gnat” neighbors, and the culmination of events that leads to her disappearance. Quirky, funny, sad, intriguing.